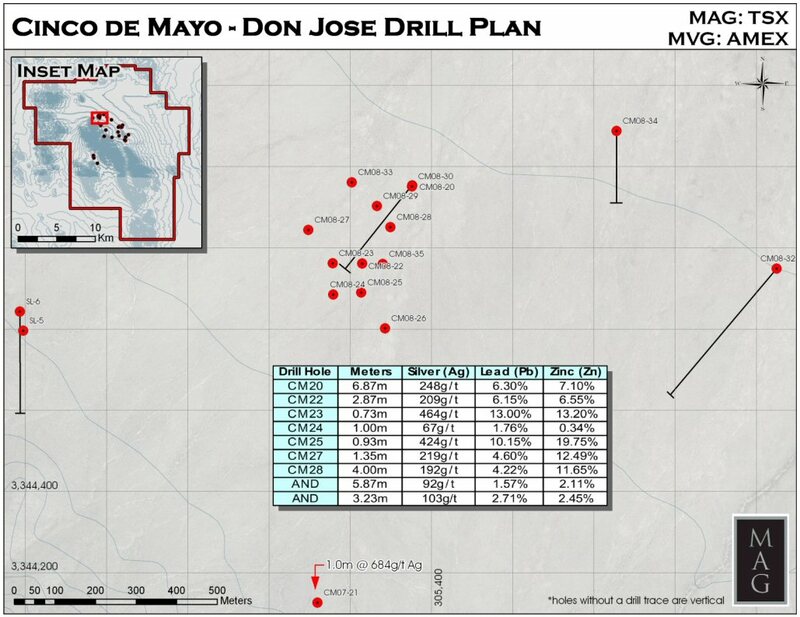 VANCOUVER, BRITISH COLUMBIA--(Marketwire - May 14, 2008) - MAG Silver Corp. (TSX:MAG)(AMEX:MVG) ("MAG") announces assay results from an ongoing drill program on MAG's 100% owned Cinco de Mayo property in northern Chihuahua State, Mexico. This drill program is expanding the "Jose Manto" discovered in Hole 07-20 which intersected 6.8 metres (estimated true thickness) of galena and sphalerite-rich massive sulphides grading 254 g/t (7.4 opt) silver, 6.4% lead and 7.0% zinc. See press release dated February 7, 2008 for details. Recent Holes 08-22 through 08-28 have now cut the Jose Manto over an area of approximately 250 by 250 metres. Assays are presented below. Highlights include Hole 08-28 reporting 4.00 metres of 192 g/t silver (5.6 opt), 4.22% lead and 11.65% zinc and Hole 08-22 which returned 2.78 metres of 209 g/t (6.1 opt) silver, 6.15% lead and 6.55% zinc. Intercepts are believed to be true widths. Mineralization is open in all directions and two rigs are currently drilling systematic 25 to 50 metre offsets of these holes to define the axis of maximum thickness of the manto and trace it towards its source. Drill plan is attached (to view please click on: http://media3.marketwire.com/docs/mag0514.jpg) and cross-sections can be found at www.magsilver.com. "We are extremely pleased with how the Jose Manto is unfolding in terms of extent and grade," said Dan MacInnis, President and CEO of MAG. "Our exploration here is hampered by a complete lack of outcrop, but the alteration zoning, mineralization textures, and continuity are similar to large-scale Mexican CRD systems nearby along the known CRD Belt, all of which were found in outcrop over 100 years ago. The combination of our exploration model, geophysics and aggressive drilling is clearly bearing fruit." All intercepts lie at about 350 to 550 metres vertical depth and appear to define a coherent massive sulphide sheet ("manto") developed within a low-angle fault cutting strongly folded limestone. Most of the holes have cut multiple massive sulphide intersections within limestones of the Finlay Formation, with the thickest and most persistent occurring near its upper and lower contacts. Textural evidence for multiple mineralization stages is strong. Cinco de Mayo is a 15,000 hectare property straddling the same regional structure that contains the largest CRDs in Chihuahua. Exploration is guided by MAG's CRD exploration model and an airborne magnetic survey that revealed a number of prominent linear anomalies and prominent magnetic lows that are being systematically drilled. The Jose Manto mineralization lies along a very strong north west-trending magnetic anomaly that runs over 3,000 metres through 07-20 to the southeast to previously reported sulphide-rich and hornfels intercepts (see Press Release of February 19, 2007). Numerous geophysical targets remain to be drilled along this trend to the northwest, and along parallel and intersecting trends elsewhere in the district. Despite the extensive alluvial cover and limited drilling, we have now cut significant mineralization within a laterally traceable low-angle structural host over more than 8 square kilometres. The drill program will continue to systematically offset the manto style mineralization intersected in drilling while simultaneously testing geophysical anomalies along the structural trends identified in drilling and from the magnetics. This early stage property is held 100% by MAG and is one of six other district scale projects operated by MAG. Carbonate Replacement Deposits (CRDs) are polymetalic Ag-Pb-Zn-Cu-Au deposits that have historically produced nearly 40% of Mexico's silver. Currently, they provide most of the zinc and lead that put Mexico in 5th and 6th place respectively in world production. The largest CRDs in Mexico define a narrow belt 2,200 kilometres long and range from 10 to over 100 million tonnes in size. The deposits are commonly exploited at rates of 2,500 to over 6,000 tonnes per day, with mining depths in several exceeding 1,200 metres below surface. Mining costs are typically very low and some of Mexico's CRD mines are among the lowest cost underground mines in the world. CRDs are zoned over kilometres laterally and vertically from: central intrusions with mineralized skarn lenses along their flanks; to mineralized skarns along dike or sill offshoots; to vertical to steeply oriented tabular or tubular chimneys composed dominantly of massive sulfides; to flat-lying tabular elongate "mantos" composed of massive sulfides; to a distinctive series of alteration styles that may extend for additional hundreds of metres from sulfides. The dominant metals change with distance from the source intrusion, with the highest silver grades occurring in the distal manto-dominated part of the system. Large CRDs are characteristically multi-stage systems showing evidence for multiple intrusion, mineralization and alteration events. This results in overprinting of the various stages and creates complex, but substantial mineralized bodies. CRD exploration focuses on position within the "CRD Belt" and recognition of where exposed mineralization lies with respect to this zoning spectrum. Mantos are traced to chimneys and from there to skarn, or vice versa. Early systematic regional exploration work and the results of initial drilling clearly show that Cinco de Mayo has many geological and mineralogical characteristics in common with the largest CRDs in Mexico. Quality Assurance and Control: The Company has in place a quality control program to ensure best practices in sampling and analysis. Samples were collected by employees of consulting firm Minera Cascabel S.A. de C.V. on behalf of MAG Silver Corp. The surface rock samples are shipped directly in security sealed bags to ALS-Chemex Laboratories preparation facilities in Hermosillo, Sonora or Chihuahua City (Certification ISO 9001). Sample pulps are shipped from there to ALS-Chemex Laboratories in North Vancouver, Canada for analysis. All samples were assayed for gold by standard fire assay-ICP finish with a 50 gram charge. Gold values in excess of 3.00 g/t were re-analyzed by fire assay with gravimetric finish for greater accuracy. Silver, zinc, copper and lead values in excess of 100 ppm, 1%, 1% and 1% respectively are also repeated by fire assay. Qualified Person: Dr. Peter Megaw, Ph.D., C.P.G., has acted as the qualified person as defined in National Instrument 43-101 for this disclosure and supervised the preparation of the technical information in this release. Dr. Megaw has a Ph.D. in Economic Geology and more than 20 years of relevant experience focused on silver and gold mineralization, CRD exploration and drilling in Mexico. Dr. Megaw is a certified Professional Geologist (CPG 10227) by the American Institute of Professional Geologists and an Arizona registered geologist (ARG 21613). Dr. Megaw is not independent as he is a shareholder and director of MAG and is a vendor of Cinco de Mayo and other projects whereby he may receive additional shares. Dr. Megaw is satisfied that the results are verified based on an inspection of the core, a review of the sampling procedures, the credentials of the professionals completing the work and the visual nature of the silver and base metal sulphides within a district where he is familiar with the style and continuity of mineralization.